The HFO R-1234yf is the refrigerant of the future. Or, at least, that is how it has been marketed. Yf was the first HFO refrigerant to see mainstream attention. A few years back there was immense pressure in the European Union to stop using the HFC R-134a for automotive air conditioning. The pressure was there due to the extremely high Global Warming Potential (GWP) that R-134a has. R-134a has a GWP of one-thousand four-hundred and thirty. It is classified as a super pollutant. The answer to the world’s problems came with the announcement of the new HFO refrigerant known as R-1234yf. Yf refrigerant has a Global Warming Potential of only four. That is a huge difference when comparing it to other refrigerants on the market today. The only downside for yf is that it is rated as slightly flammable or 2L from ASHRAE and other air conditioning organizations. The European Union quickly phased down and out R-134a and had their new vehicles start taking R-1234yf. While the acceptance of yf is much slower here in the United States there are numerous vehicle manufacturers who have begun using this refrigerant in their newer model vehicles. With each year that passes more and more vehicles begin taking yf. To read more about 1234yf please click here to be taken to our official refrigerant fact sheet on yf. One of the very first steps when it comes to diagnosing a vehicle’s air conditioner is understanding the temperature and the current pressure that your system is operating at. Having these facts along with the saturation point, the subcool, and the superheat numbers for the refrigerant you are working on are essential when it comes to really understanding what is going wrong with your system. There you have it folks. I hope this article was helpful and if you find that something is inaccurate here in my chart please do not hesitate to reach out to me. I have sourced this the best I could but there is always going to be conflicting data. I’ve seen it multiple times on various refrigerants. I’ll search for a refrigerant’s pressure chart and get various results all showing different pounds per square inch temperatures. The aim with this article is to give you accurate information so again, if you see anything incorrect please let me know by contacting me here. On top of this post we are also working on a comprehensive refrigerant pressure/temperature listing. 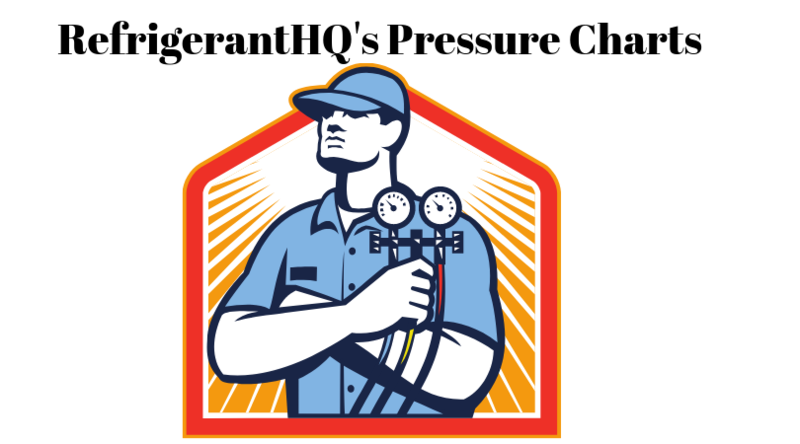 The goal is to have every refrigerant out there listed with a pressure/temperature chart that is easily available. One of the very first steps when it comes to diagnosing your home air conditioner, refrigerator, or even your vehicle’s air conditioner is understanding the temperature and the current pressure that your system is operating at. Having these facts along with the saturation point, the subcool, and the superheat numbers for the refrigerant you are working on are essential when it comes to really understanding what is going wrong with your system. After a visual inspection the very next step for the most seasoned technicians is pulling out their gauges and checking the pressure and temperature. It just becomes second nature after enough calls. I have heard stories of rookie techs calling some of the pros on their team for help on a system that they’re stuck on. It doesn’t matter what the situation is. It doesn’t matter if you’re in Miami or in Fargo. It will never fail that one of the first questions the pros ask the rookie is what is your subcool and what is your superheat? Having and understanding these numbers is key to figuring out what to do next. But, these numbers won’t do you any good if you don’t know what refrigerant you are dealing with and what the refrigerant’s boiling point is at each pressure level. This article aims at providing you with just that information. The HFC R-32 refrigerant is quickly becoming popular, more so then it already was. Most of you know R-32 as a necessary component in the widely popular HFC blend known as R-410A Puron. R-32 along with R-125 gets you that R-410A that is found in nearly every air conditioner today. However, in recent years there has been a push to slowly phase down R-410A. That is because of 410A’s very high Global Warming Potential, or GWP. The higher the GWP the more harm the refrigerant does to the climate. R-410A has a GWP of over two-thousand whereas R-32 has a GWP of only six-hundred and seventy-five. While R-32 isn’t perfect it is a lot better then R-410A. That is why we are beginning to see a rise of usage of R-32 in the European Union and here in the United States as well. I do not foresee this becoming a long term trend but only as a temporary place holder until the world finds a more suitable R-410A replacement. If you would like to read more about R-32 refrigerant please click here to be taken to our refrigerant fact sheet. R-22 refrigerant is the major refrigerant, or… it was. R-22 was invented by a partnership with General Motors and DuPont back in the 1930’s. In the 1950’s the use of R-22 exploded and for nearly sixty years it was THE refrigerant to be used in home, office, and commercial air conditioning. Along with air conditioning it was also used in chillers, ice rinks, and many other applications. It was in the 1980’s that it was discovered that R-22 was damaging the Ozone layer with the chlorine that it contained. In order to correct this R-22 was phased out across the world. Here in America our phase out began in 2010 and the refrigerant will be completely phased out in 2020. Taking R-22’s place is the HFC refrigerant blend known as R-410A, our Puron. As I write this article, in 2019, there are still thousands of R-22 machines out there, but they are a dying breed and within the next ten to twenty years R-22 will be as rare to find as R-12 is today. If you would like to read more about R-22 Freon refrigerant please click here to be taken to our refrigerant fact sheet. R-404A rose to prominence in the late 1990’s with the phasing out of CFC and HCFC refrigerants like R-12 and R-502. There had to be a replacement for the Ozone damaging refrigerants of the past and the successor was the HFC R-404A that we all know of today. If you would like to read more about R-404A refrigerant please click here to be taken to our refrigerant fact sheet. R-410A, or Puron, is one of the most popular refrigerants in today’s modern world. However, if you rewind just fifteen or twenty years you would find that very little people even knew about it. Most contractors and technicians worked with R-22 systems for home and commercial air conditioning. R-22 had been the standard bearer refrigerant for nearly fifty years. However, R-22 harmed the Ozone Layer and a replacement refrigerant needed to be found. This is where our friend R-410A came into play. New machines from 2010 and onwards were banned from using R-22. Instead, they were outfitted with R-410A. If you would like to read more about R-410A refrigerant please click here to be taken to our refrigerant fact sheet. A few decades ago very few people had heard of using propane as a refrigerant. Propane was the stuff you use in your grill and what powered your forklift. While the concept of using R-290 as a refrigerant had been around for over a century it was rarely used due to the flammability risk. Over the years though technology has improved and the need for an environmentally refrigerant has surfaced. The HFC refrigerants that most of the world uses today have a huge impact on Global Warming and an alternative needed to be found. Propane provides the answer to that alternative. Already today in the United States we are seeing propane in vending machines, ice machines, stand alone supermarket refrigerators/freezers, and in many other applications. As time moves forward and the Environmental Protection Agency becomes more comfortable with R-290 we may begin to see more and more applications be authorized to use propane. If you would like to read more about R-290 propane refrigerant please click here to be taken to our refrigerant fact sheet. Isobutane is being seen more and more across the world. This holds especially true as various countries begin to phase out the ever common HFC refrigerants such as R-404A and R-134a. There will come a time where HFCs area thing of the past and we need to be ready for it. Today we are seeing isobutane based systems in home refrigerators/freezers, vending machines, ice machines, stand alone supermarket refrigerators/freezers, and many more expanding options. While they are quite popular in Europe and in Asia it is only a matter of time before they start showing up in United States. If you haven’t run into one of these systems yet then it’s only a matter of time. For more information on R-600a please click here to be taken to our R-600a Refrigerant Fact Sheet.